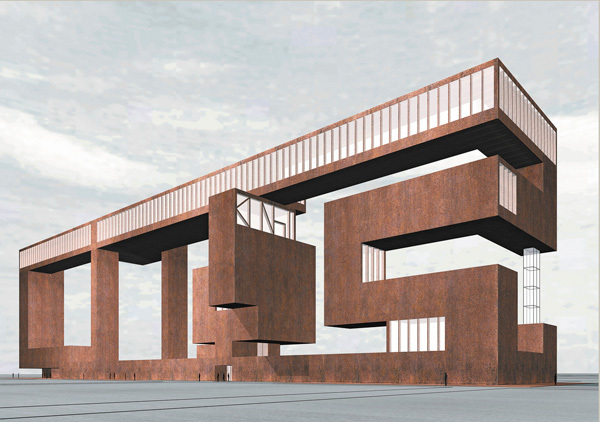 Simon Ungers, Rendering from Art City, 2005. Ink-jet print on board. SFMOMA turns 75 this month. We’ve just published a new collection catalog, 75 Years of Looking Forward, highlighting, as the curators of The Anniversary Show and the catalog, Janet Bishop, Corey Keller, and Sarah Roberts, write, both “the inarguably significant and the admittedly idiosyncratic” of the museum’s collecting, exhibiting, and presenting history. This month we’re featuring excerpts from the catalog here on the blog. Today’s essay is from SFMOMA Helen Hilton Raiser Curator of Architecture and Design. Architecture entered the modern art museum in the 1930s and has maintained, ever since, a dialogic and sometimes uneasy relation to the artistic practices it adjoins. What happens as architectural works yield to the spatial conventions of the gallery, severed from the contexts they were meant to inhabit? How does architecture become significant to an audience that may have little familiarity with its disciplinary concerns? And what happens as architecture is drawn toward the habits of perception and interpretation that characterize the experience of viewing art in museum galleries? Situated somewhere between aesthetic, social, and professional practices, its documents often referring to buildings or objects outside of the gallery, architecture only makes sense in an art museum if its relationship to other fields is theorized and mediated through collecting and exhibiting practices. Traditional modernist strategies—such as the assimilation of architectural drawings to the conventions of works on paper and models to those of sculpture—have arguably reached their endpoint. And so it becomes the task of the curator to make this relationship meaningful in the present by developing relevant approaches to collecting and presenting architecture. 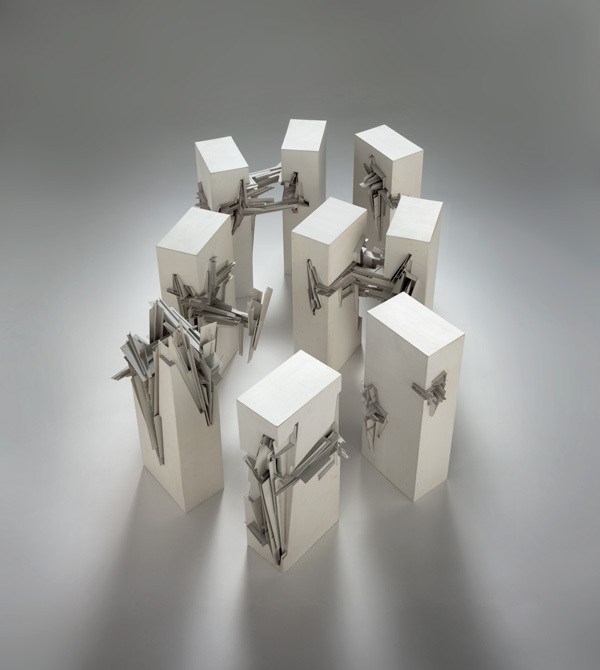 Lebbeus Woods, Nine Reconstructed Boxes, 1999. Eight polystyrene models, dimensions variable. There are, I believe, two somewhat marginal practices that bear further elaboration now. The first, installation architecture, offers a unique opportunity to present audiences with an immediate and embodied experience of architecture within the gallery; its program and scale often call into question various principles of museum display, allowing new meanings and forms of occupation to unfold. The second, the focus of this essay, is visionary architecture, which can comprise drawings, sketches, models, and other media such as collage and film. Visionary architecture offers spatial and social constructions that posit alternatives to normative architecture and the sociopolitical conditions it fixes in place. Visionary work—intermittent through the history of architecture with particular concentration during the late eighteenth century, early twentieth century, and the period since the late 1960s—draws viewers away from understanding architecture as fact toward an understanding of architecture as thought or project (a kind of throwing forward, a pro-ject). I am not entirely comfortable with the term visionary, as it implies prophecy and genius rather than the more analytical and speculative qualities that interest me; it can nonetheless serve to mark a range of works that hover around this understanding of architecture’s critical function. Unlike other kinds of architectural artifacts, ranging from drawings and models of built or unbuilt work to building fragments and period rooms, visionary architecture does not stand in for something that exists elsewhere, outside the gallery. A drawing, model, or photograph of, say, the Seagram Building derives significance not only from its intrinsic qualities but also from the importance of the building it depicts, a building that cannot otherwise be exhibited. A work of visionary architecture, however, stands on its own, acting as image and argument rather than document. However referential, it speaks directly and immediately, as works of art do, while doing something art does not often do: it hypostatizes some future or alternative arrangement. Not necessarily utopian or based in fantasy, visionary work may just as well be rooted in dystopian thought or sober analysis. 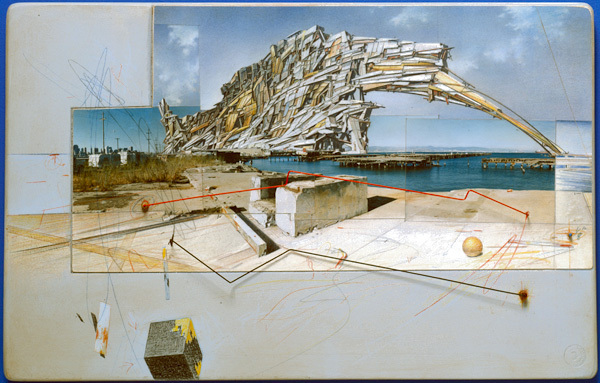 Consider, for example, Lebbeus Woods’s Nine Reconstructed Boxes (1999, above), acquired for the collection in 2008. These exquisite models and accompanying sketches demonstrate a dramatic counterpoint between the bureaucratic architecture of boxy towers— the modernist architectural form par excellence—and dense, highly individuated zones that gather irregular fragments and shards into a kind of micro- or anti-architecture. These zones appear to arise spontaneously, at odds with their host structures, to produce extreme spatial complexity. As with Woods’s other investigations into how architecture might address urban poverty or the effects of war and natural disaster, this project elaborates a populist, radically democratic vision of architectural formation, a way of building and rebuilding that rises charismatically and spontaneously against ossified forms of control. Woods’s San Francisco Project: Inhabiting the Quake (1995) likewise borrows conventions of architectural representation and shifts them decisively toward the realm of critical speculation. In this project, commissioned by the museum, Woods proposed ten scenarios for reconstructing abandoned waterfront sites after the devastation of a major earthquake. Working again with a palette of scrappy forms assembled into dense, tentative configurations, Woods imagines an architecture that embraces instability within a matrix of fluid, even cataclysmic conditions. These extraordinary assemblages, composed of drawings, photographs, and bent wire elements, consider how architecture, so committed to stability and permanence, might embrace the unpredictability of history and nature to incorporate instability into its very foundations. Lebbeus Woods, San Francisco Project: Inhabiting the Quake, Quake City, 1995. Graphite, colored pencil, pastel, acrylic, chromogenic print, paper, wood, and metal. Surely one of the most important visionary architects of our time, Woods is well represented in SFMOMA’s collection, which also holds important examples of earlier projects, including his 1986–87 series Centricity. His work joins that of Constant, Zaha Hadid, Craig Hodgetts, Steven Holl, Jim Jennings, Lars Lerup and Sohela Farokhi, Lewis.Tsurumaki.Lewis, Claude Parent, Simon Ungers, and others who, in the last half-century, have articulated visions, however heterogeneous, that are speculative, critical, and completely out of the ordinary. These challenging, sometimes mind-bending works form a fairly modest proportion of a collection that includes scores of architectural models and drawings that are more professional, theoretical, analytical, or abstract than what one might call visionary. Yet, importantly, they mark a terrain of collecting that strengthens and complicates the dialogue between architecture and the visual arts by maintaining a primary focus on form as critique. Steven Holl’s Edge of a City (1988), for example, proposes a range of strategies for defining rich spatial zones along the edges of different cities. Developed during a period of accelerating urban sprawl, Holl’s watercolor sketches and models elaborate a focused yet open-ended way of thinking differently about defining, inhabiting, and enriching urban boundaries. Another example of form as critique, Claude Parent’s La Sur-face de la ville oblique (The Surface of the Oblique City, 1971/1999), imagines an urban form that sets aside the hegemony of the Cartesian grid to explore the liberatory potential of the diagonal or oblique surface. The material qualities of these drawings and models allow them to be perceived as if works on paper or sculpture. Looking at works of visionary architecture, one might speak of their beauty, their technique, and their relationship to other artistic practices. Moreover, visionary architectural drawings fit into frames that can be hung on white walls. They do not demand special display arrangements as do installations or building fragments; visionary models likewise fit onto pedestals and under vitrines as if sculpture. Generally made by individual authors, rather than firms or studios, visionary architecture can also be easily assimilated to museum practices for classifying and valorizing works of art. At the same time, works of visionary architecture mark an important difference from the works of art whose conventions they resemble. Without exception these works articulate new ways of thinking about the transposition of social values into built form. Consider Simon Ungers’s Art City (2005, see picture at top), an urban compound that joins artists’ living quarters, studios, exhibition areas, and performance spaces within a heroic superblock to advocate the priority of collective cultural values. Like other visionary projects by Ungers in the collection, Speaking Architecture (2000) and Silent Architecture (2003–4), Art City aims to recapture and reinvigorate architecture’s historical capacity to articulate cultural priorities and inspire awe. Works of visionary architecture are propositions above all, efforts to imagine a reality that is not. As critique they underscore and expose the instrumental political effects of architecture; they reveal how another society, organized according to different principles and concerns, might arrange itself. This is abundantly clear in Constant’s New Babylon project of the 1950s and 1960s, which Constant characterized as “another city for another life.” Housed by a museum, visionary architecture cannot help but point toward realities beyond the frame, the pedestal, and the gallery. On the map of your empire, O Great Khan, there must be room both for the big, stone Fedora and the little Fedoras in glass globes. Not because they are all equally real, but because all are only assumptions. The one contains what is accepted as necessary when it is not yet so; the others, what is imagined as possible and, a moment later, is possible no longer. Works of visionary architecture join the museum collection as so many chimeras, only to reveal the chimerical dimension of what appears real and certain. It is precisely this tension, this irreconcilable push-and-pull between the possible and the real that renders visionary architecture at once vital and unnerving to the modern art museum. It demands to be seen in terms of not only what it represents but also what it counteracts, challenging us to comprehend what is, what is not, and what could still be. In his influential text “Of Other Spaces,” Michel Foucault advanced a concept of heterotopia that has informed my approach to making exhibitions and building a collection for SFMOMA. Heterotopia, in Foucault’s account, is an odd, destabilizing, and productive relation among discursive spaces (perhaps akin to what I have posited as the strange, fertile mismatch between architecture and other curatorial disciplines). Foucault first introduced the concept of heterotopia in Les Mots et les choses (1966, published in English as The Order of Things in 1970) with reference to a bizarre taxonomy of animals from a Chinese encyclopedia. The passage groups together, under the category of animals, things that are so incongruous that they cannot be understood as part of a single entity. Their association, their adjacency, cannot be imagined within our way of giving order to things. Museum collections are by nature heterotopic; they remain heterogeneous assemblages of fragments even if conventional forms of exhibition practice seek to ascribe narrative coherence and a reassuring seamlessness. Museums gather, over long periods of time, objects that often do not make sense together. There is a considerable element of chance in how museum collections grow; this random, nonlinear aspect of collecting, if cultivated, helps move us toward understanding the collection as a charged field of differences rather than, as modernist ideology might have imagined, something more integrated, progressive, and authoritative. Within the complex matrix of knowledge and things that characterizes a museum collection, visionary architecture may play a pivotal role. Visionary work marks a form of creative labor that is critical, counternormative, and hopeful. However much its propositions may appear dated over time, they nonetheless advance a nonlinear model of historical change at odds with dominant narratives of modern culture. Visionary works irrupt into the here and now, bearing traces of earlier arguments about the future, the elsewhere, and the imaginable. As such they help museums act as agents, and not simply repositories, of culture, nurturing the special capacity of museums to sustain a collective, critical engagement with the way things are.